This blackened salmon recipe is very simple - it would work equally well with any fillet of fish. Pan frying is most suitable, but it's also quite possible to grill or barbecue this dish. If you do, then brush with oil during cooking. 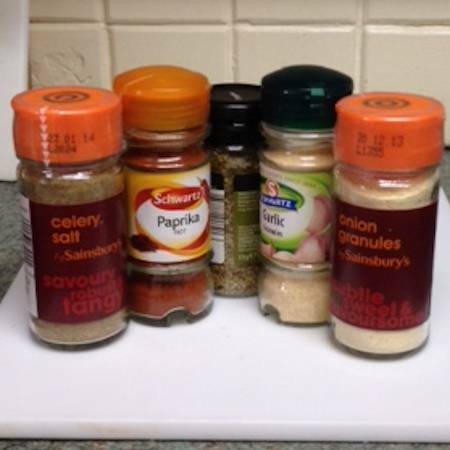 The spice mixture coats, crisps and flavors the salmon fillet. You can leave the skin on or take off as you prefer. Serve it with some new potatoes, salad and coleslaw. A lot of people really like the salmon skin - it crisps up beautifully during this cooking method and will be very tasty. Mix all the seasonings together and put on a plate. Dip the salmon in milk then into the seasoning - make sure it is coated well. Heat the butter in a thick frying pan until it foams - add the fish and fry either side for a few minutes - until the fish is cooked through and the spice mixture is 'black'. Serve hot with the now seasoned butter poured over - a few new potatoes and a mixed salad go well with this. If you choose to barbecue, then brush the fish with oil during cooking. Fabulous Blackened Salmon - lovey spicy coating and pan frying makes it super crispy and tasty.